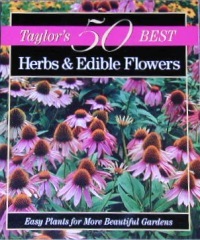 This is a big little book that is full of photos and tips on how to grow and use 50 of both common and not so common herbs and their flowers. Short courses on pH, attracting birds, conserving moisture, mulching, over wintering difficult plants plus culinary tips and fun facts make this reading for a quick study. Perfect for beginners or those looking to expand the uses of the herbs they already have.